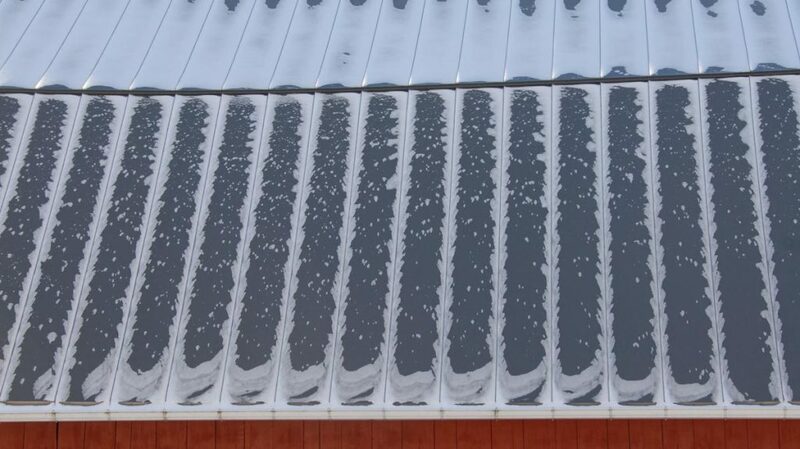 Over the last few years I have often made a promise to take pictures of the snow patterns which occur on the steel panels of our barn roof. It is a view we see whenever we look out the B&B kitchen window, so it is easy to notice the variety of designs which appear throughout the winter. Once winter is over I then realize that I failed to keep my promise. This year, however, I am trying to keep the promise. So far I have succeeded. Sadly there has been a problem in this regard, i.e. a lack of significant snow falls. A few days after Thanksgiving we experienced a minor snow fall. It hardly needed shoveling and within a few days it was gone. 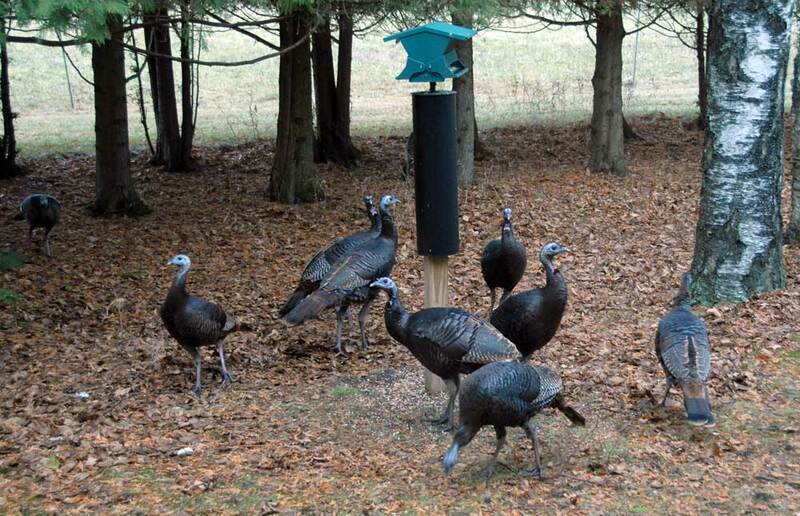 One of our local flocks of Turkeys made sure they arrived after Thanksgiving. This crowd usually numbers around 20 birds. Most of the bunch was busy under one of our bird feeders while the rest were just down the way under a second feeder. As is evident in the picture they had no snow to scratch through to get to the seeds on the ground. It was not until Christmas Eve that we saw any further snow and this occurrence was even lighter than the first one a month earlier. Finally, on New Year’s day, we experienced a good heavy snow. Ironically, the next day, when I went to work blowing the snow off the driveway, after half of the job was done, my “trusty” snowblower literally stopped, quite suddenly! It took another day to get the blower fixed and to remove the last of the snow. In the mean time the County got the road cleared in front of the B&B. 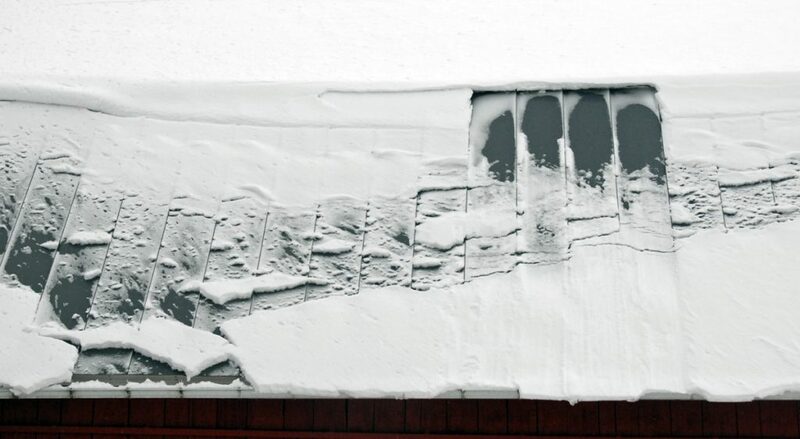 At least this snow stayed around for a few days, including the layer on the barn roof, which after a few days warmth began to slide off the roof in separate avalanches. Since that time we have experienced a few light dustings of snow, often mixed with freezing drizzle and rain. None of those occurrences have left any patterns of interest on the barn roof. 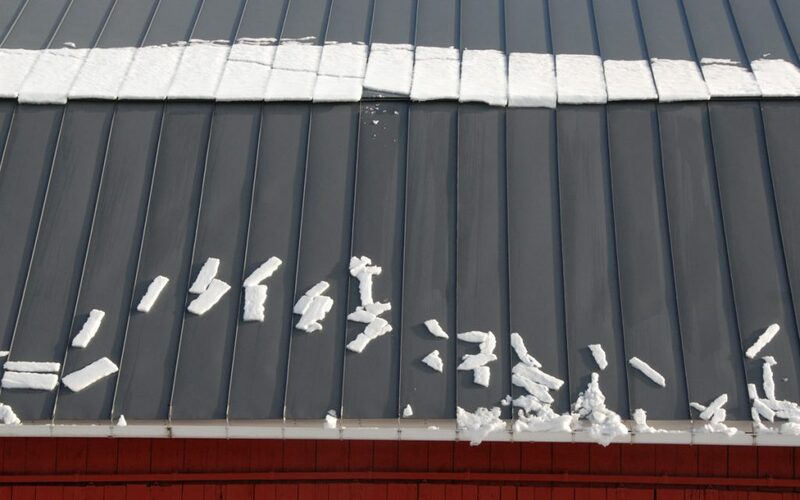 So, without further delay, here is my still rather meager collection of snow patterns on the barn roof. The first images dates from the first and only snow fall in November. To my mind it is reminiscent of feathers. On December 24th we have another “feather collection”, but not nearly as whimsical. Finally, on January 1, 2019 a good, heavy, wet snow, which even before the day was over began sliding off the roof in sections. It was not nearly as fanciful and a bit more sinister. Within four days the snow on the lower, steeper level had slide off completely and was replaced by smaller rectangular chunks coming from the upper level. While we wait for more snow, we find ourselves regularly in the barn. The entire flock is getting their hooves trimmed. In addition those who need it are getting their faces trimmed for better vision, along with being fitted with larger jackets, which will hopefully get them through the next couple of months before shearing. We are taking things slowly, five sheep per day. An update will follow once everyone is prim and proper. Love the pictures of the roof. 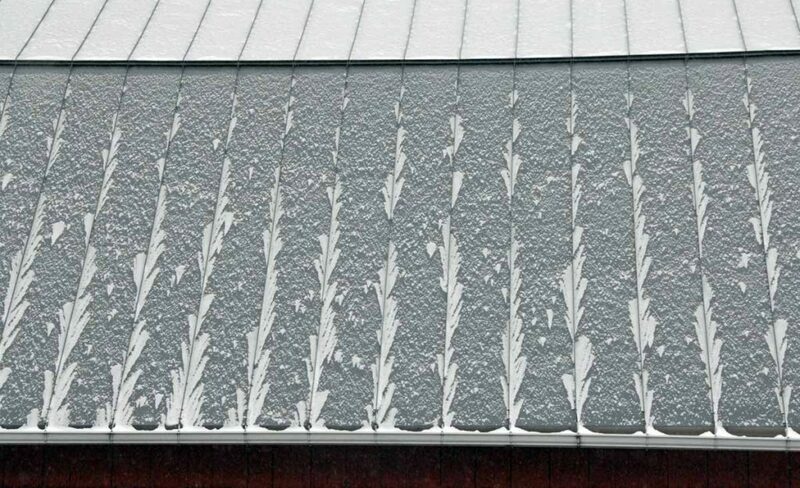 We haven’t had enough snow for anything pretty on our farm roof. Just rain. It’s always great reading about the farm. We are getting the snow you are not getting…9 inches last Saturday! We’re expected to get another 2-5 this Saturday. The snow does look like feathers! Quite lovely. We have had almost no snow, but today (1/18) finds us waiting for a big storm to arrive early tonight. Sure hope Ralph’s snowblower doesn’t quit on us. Sounds like life is very busy as usual for both of you. Hope to see you this winter. Thanks for the update. 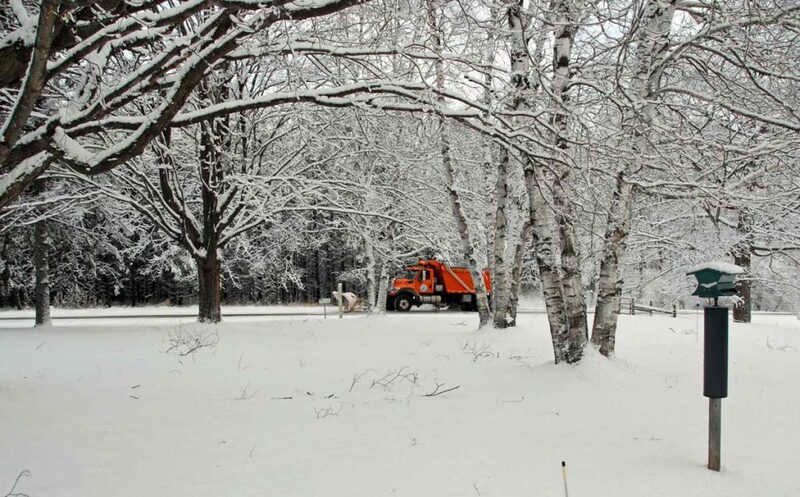 It has been a low snow winter so far here in Door County. Hopefully we will not get dumped on in April! Love the barn roof photos. Good luck with your continued regimen getting the flock primped and made pawfect for spring!